These hands don't want to make any balloon animals! So, if you had Pennywise's hands, what would you do with them? Would you climb down a sewer and poke your hands through the opening to scare little children? Would you scratch yourself a lot because the nails are so long and pointed? Would you use those same nails to pop shiny balloons held by innocent youngsters? Well, now is your chance to explore what exactly you would do by using these cool Pennywise gloves! The Pennywise gloves are molded from latex and feature painted details. 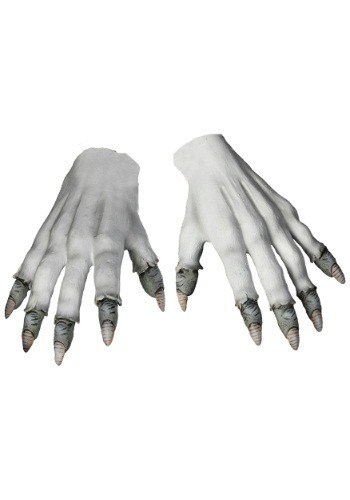 The details make these gloves look ridiculously creepy, like the pointed fingernails and the bony fingers. You'll be the scariest clown of all time when you pass out candy to unsuspecting children while wearing this officially licensed accessory! Pair them with your Pennywise costume for a look that will scare many generations. Standard Length (fingertip to wrist) 12" 12"